There is a growing consensus in the scientific realm that the world’s oceans are reaching a state of crisis as commercial fisheries are more widely overexploited and many coastal ecosystems are approaching collapse. A number of scientists and resource managers have argued that a successful understanding of the current crisis can be found through the development of a deeper historical perspective of the ecology of coastal ecosystems and the impacts that humans have had on them. In Modern Oceans, Ancient Sites: Archaeology and Marine Conservation on San Miguel Island, California, Todd Braje works to provide just such an understanding, bridging the divide between the archaeological record and the modern crisis. Using archaeological, paleoecological, and historical datasets from California’s Channel Islands and the larger Santa Barbara Channel region, Braje explores the evolving relationship between humans and fragile island ecosystems. San Miguel Island, westernmost of the Northern Channel Islands, holds archaeological records spanning 10,000 years, providing a backdrop for the examination of changes in human demography, subsistence, and technology over time. Braje’s systematic excavations of five well-preserved sitesranging from a 9500-year-old shell midden to a 150-year-old abalone fishing camptranslate into a long-term case study that enables a unique assessment of the human impacts on marine ecosystems. Modern Oceans, Ancient Sites: Archaeology and Marine Conservation on San Miguel Island, California helps to provide a more complete picture of human sea and land use through time, offering vital information for understanding, interpreting, and managing the past, present, and future of both the Channel Islands and global marine ecosystems. Braje demonstrates the relevance of archaeological, historical, and paleoecological data to extant environmental problems and concludes with tangible and practical recommendations for managing modern marine ecosystems and fisheries. Todd J. Braje is an anthropological archaeologist who specializes in the archaeology and historical ecology of North American Pacific Coast maritime societies. He is an assistant professor of anthropology at Humboldt State University. 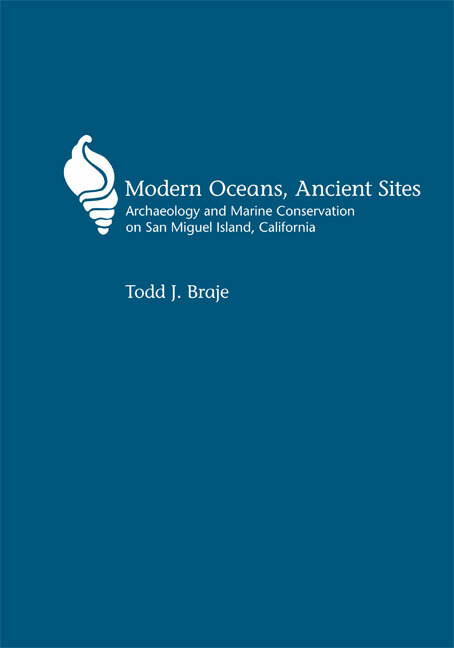 "In his book, Modern Oceans, Ancient Sites, Todd Braje provides a promising avenue through which archaeologists can help solve modern problems—by providing time depth to ecological conservation efforts.... The data in these chapters are valuable and well presented.... The introductions and conclusions of each chapter nicely place the data within the big picture argument."